March 15: Hungary’s national holiday commemorating the outbreak of the 1848 revolution against Habsburg rule. Always a lot of street politics on this date, especially this year with the general election just over three weeks away. 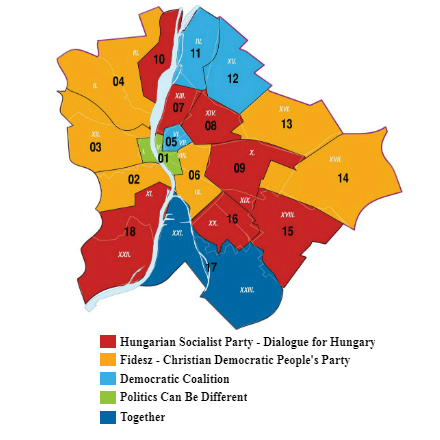 Orange Files covered simultaneous events in Budapest on this day: the Civil Cooperation Forum (CÖF)–organized pro–Orbán government Peace March (Békemenet) and the Hungarian Two-Tailed Dog Party (Kétfarkú Kutya Párt, or MKKP)–organized anti–Orbán government Peace March. It was the seventh Peace March that the government-organized non-governmental organization CÖF has organized since 2012. It was the first Peace March that the extra-parliamentary joke party MKKP has organized. The official and unofficial slogans, respectively, of the Civil Cooperation Forum’s Peace March: “The Homeland Before All Else!” (A Haza Minden Előtt! 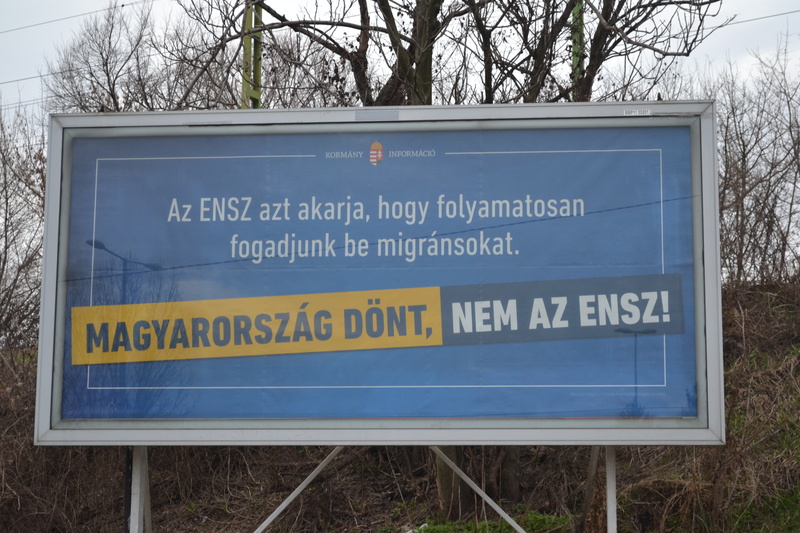 ); and “Hungary Protects Europe!” (in English). The official and unofficial slogans, respectively, of the Hungarian Two-Tailed Dog Party’s Peace March: “The Banner Before All Else!” (A Molinó Minden Előtt!) and “Let Hungary Be the Land of Two Peace Marches!” (Legyen Magyarország a Két Békemenet Országa!). Below are some of the photographs that Orange Files and his assistant (wife) took at the CÖF and MKKP Peace Marches held on March 15, 2018. Many tens of thousands of demonstrators participated in the Civil Cooperation Forum Peace March. Around 10,000 people participated in the Hungarian Two-Tailed Dog Party Peace March. Hungarian Two-Tailed Dog Peace March proceeds down Rákóczi Avenue. See all photographs from seventh Civil Cooperation Forum Peace March. See all photographs from the Hungarian Two-Tailed Dog Party Peace March. Most of the photographs of the MKKP Peace March focus on signs that display absurd or punny Hungarian-language text or refer to current scandals involving Fidesz and Christian Democratic People’s Party (KDNP) officials and their family members. Below are two short videos taken at the dual Peace Marches in Budapest. The video on the top shows the CÖF Peace March proceeding past a stage on which an opposition group placed loudspeakers playing Stalinist-era communist anthems. The video on the bottom shows the MKKP Peace March proceeding with communist anthems of the same type playing from a loudspeaker on an accompanying truck. Both refer to the playing of such anthems at May Day parades during the communist era in Hungary. The communist anthem played at the CÖF Peace March was a serious reference to the communist-like authoritarianism of the Orbán government and the Fidesz-KDNP alliance. The communist anthem played at the MKKP Peace March was an absurd reference to the restoration of authoritarian government in Hungary two decades after the fall of communism. 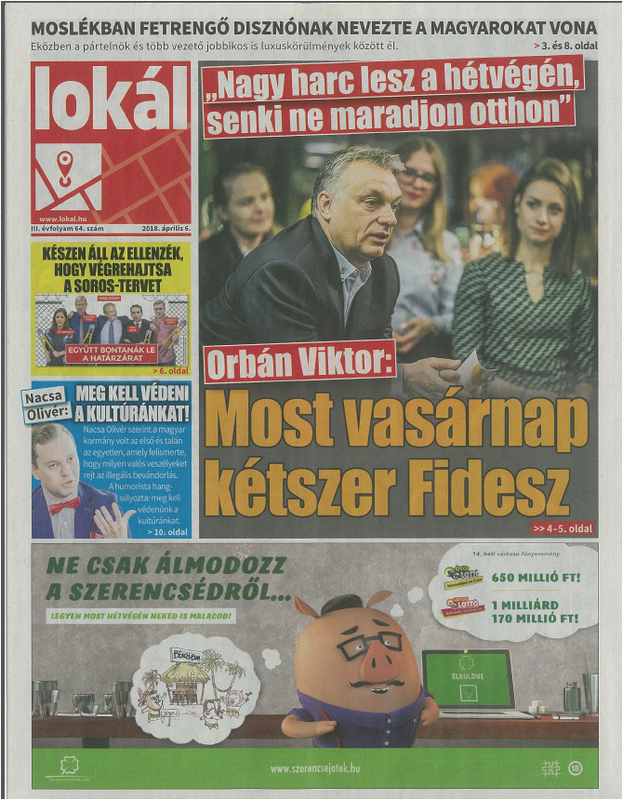 Above are Orange Files photos of the two main 2018 election campaign signs (click to enlarge) of the Viktor Orbán–led government of Hungary and Fidesz political party. 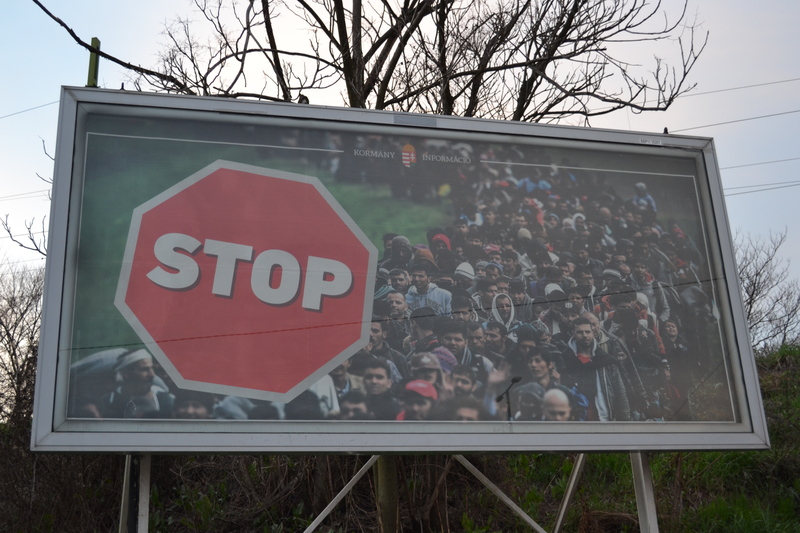 They currently appear in large number on billboards, advertising columns and bus-stop shelters throughout Budapest (and presumably all of Hungary). The UN wants us to continuously receive immigrants. 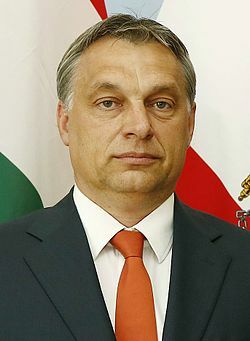 ———HUNGARY DECIDES, NOT THE UN! The Orbán government sign refers to the proposed “Global Compact for Safe, Orderly and Regular Migration” that the United Nations published in February 2018 (see document). Minister of External Economy and Foreign Affairs Péter Szijjártó announced on March 1, 2018, that the Orbán government rejects the basic premise of the proposed UN compact, which according to Szijjártó is that “migration is a good thing and unstoppable” (source in English). This is obviously utter nonsense. It’s incomprehensible why they would think us to be such raving lunatics as to accept this and then implement it. We must bluntly state that Hungary is not a country of deranged people. We understand that George Soros’s organizations have not only installed themselves in Brussels and Budapest, but also in New York, at the UN. We understand that they are spending incalculable sums of money on pushing through acceptance for migration at a global level. For the opposition leaders, Soros’s will is the most important. They are prepared to implement the Soros Plan: they would dismantle the border barrier and settle immigrants [in Hungary]. Therefore, although they appear to be hopelessly feeble, they are nevertheless dangerous. 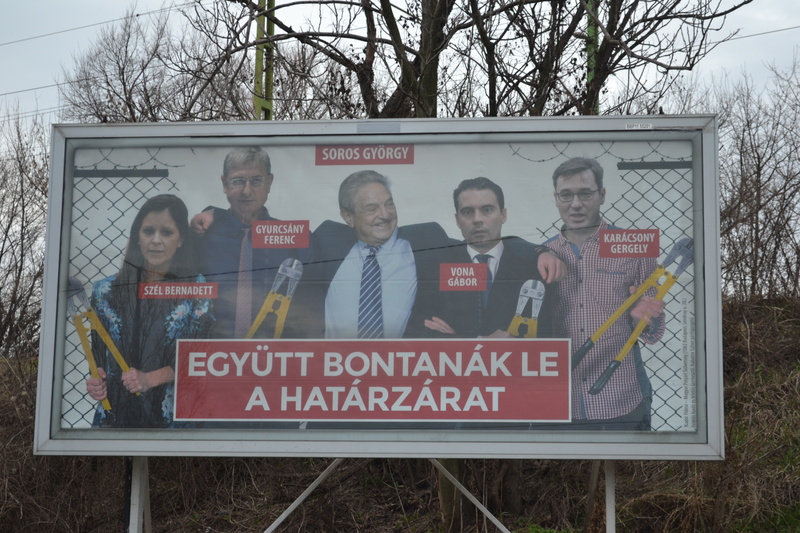 In fact, neither George Soros nor any of the four prime ministerial candidates shown on the sign, nor the five parties they represent advocate dismantling Hungary’s southern border barrier (source in Hungarian). Hungary stands before two paths from which it can choose: either there will be a national government and then we won’t be a country of immigration; or György Soros’s people will form a government and then Hungary will become a country of immigration. 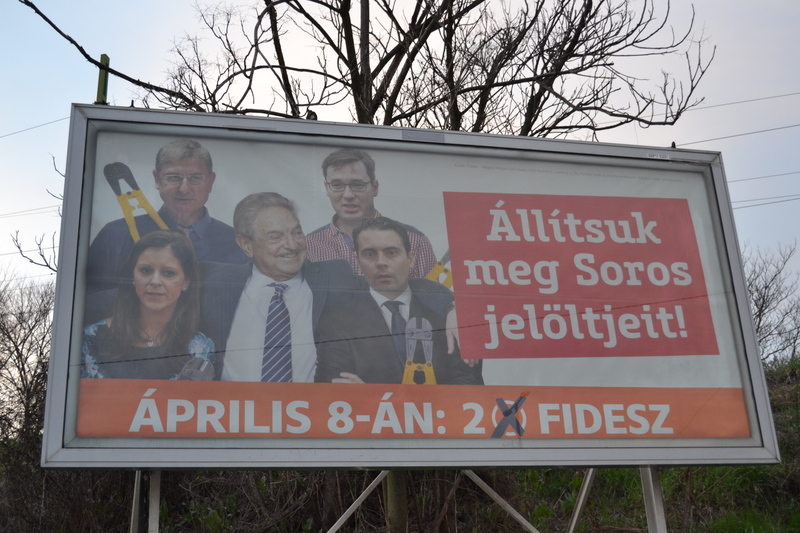 Update: two weeks before the general election, the Orbán government and Fidesz replaced the above campaign signs with those shown below. 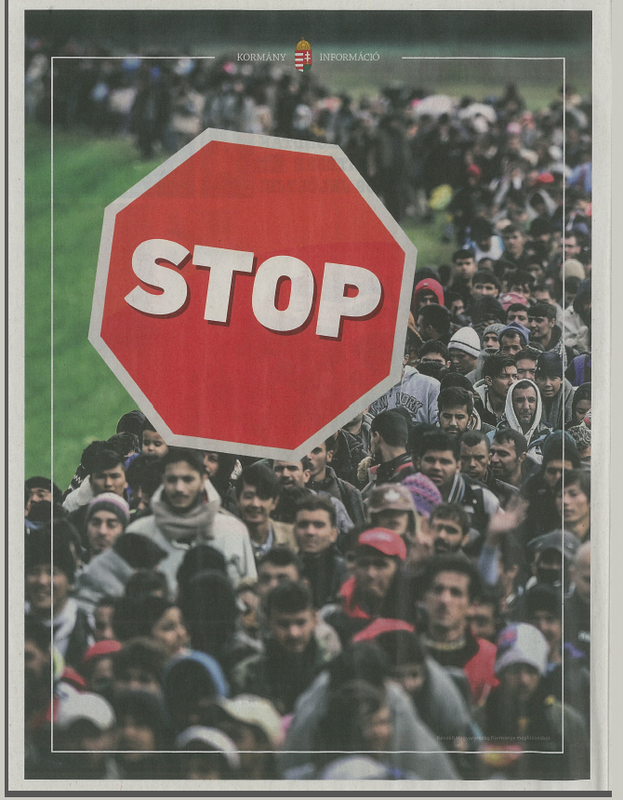 On the left is the government sign, which displays a stop sign superimposed on a dense column of migrants. On the right is the Fidesz sign, which displays the same five people as the party’s previous sign next to text reading “Let’s Stop Soros’s Candidates! Hungarian lawyer and political scientist István Bibó published a book in 1946 entitled The Misery of Small Eastern European States (A kelet-európai kisállamok nyomorúsága) in which he employed psychoanalytical precepts to determine the cause of “the adulteration and corruption of democracy in its most diverse forms” in the states of central and eastern Europe, specifically Poland, Czechoslovakia and Hungary. 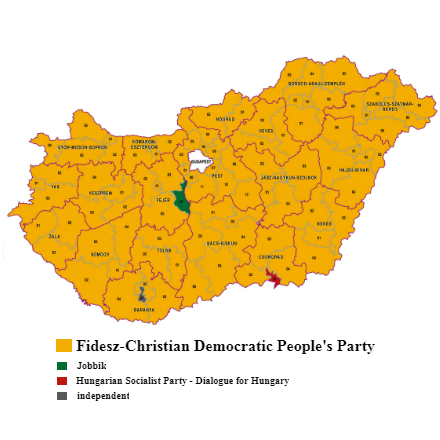 Bibó’s diagnosis: political hysteria stemming from unresolved historical traumas—in the case of Poland, partition of the Russian-Prussian-Austrian partition of the country beginning in 1772; in the case of Czechoslovakia, the German-Hungarian partition of the country in 1938–1939; and in the case of Hungary, defeat in the 1848–1849 revolution against Habsburg rule and partition of the country’s Dual Monarchy-era territory via the 1920 Treaty of Trianon. Bibó maintained that the partitions of Poland and Czechoslovakia had engendered the same attitude of skepticism toward Europe and democracy among the Polish and Czechs and Slovaks and prompted the leaders of those countries to conduct the forced expulsion of Germans and Hungarians following the Second World War. This situation gives rise to the most characteristic trait of the imbalanced central and eastern European mentality: existential fear for the survival of the community. . . . For a western European, the talk of statesmen from any small, eastern European nation referring to the “death of the nation” or the “destruction of the nation” represents empty phraseology: a western European can imagine extermination, subjugation or slow assimilation, though the notion of total political “destruction” is for them nothing more than a bombastic image, whereas for eastern European nations it is a palpable reality. Existential fear for the survival of the community was the decisive factor that rendered the status of democracy and democratic development unstable in these countries. . . . these nations experienced historical situations which appeared to confirm that the collapse of the oppressive political and social powers of the past and the adoption of democracy along with its ultimate consequences expose the national community to heavy risks, even catastrophe. This shock gives birth to the most hideous monster of modern European political development: anti-democratic nationalism. It is not possible to take advantage of the benefits of democracy in this state of convulsive fear which believes that the advance of freedom threatens the national cause. To become a democrat above all entails the absence of fear: fear of other opinions, of other languages, of other races, of revolution, of conspiracy, of the unknown evil intentions of the adversary, of enemy propaganda, of contempt and all other imaginary dangers that become real dangers if we fear them. . . . In the midst of this fear and continual feeling of threat, that which in true democracies gains recognition only in the hour of true danger, becomes standard procedure: the restriction of liberties, censorship, the search for enemy “stooges” and “traitors,” the imposition of order or the appearance of order and national unity to the detriment of liberty. The distortion and corruption of democracy has appeared in diverse forms through the use of methods varying from the most subtle and often unconscious to the most crude: the manipulation of universal suffrage against democratic development, the system of coalitions and compromises founded on unhealthy and ambiguous terms, electoral systems or abuses serving to either inhibit or distort the healthy formation of collective will, putsches and transitory dictatorships. In the course of this development, political figures of a unique type became characteristic of political life in central and eastern Europe: the phony realist. This type of political figure, which either descended into politics from an aristocratic environment or rose into it on the wings of representative government and democratic forces, was characterized by both unquestionable talent as well as a certain cunning and a certain aggression that made him perfectly suitable to become the administrator and repository of the distortion of democracy, of anti-democratic government flowing within the boundaries of democratic form or of some other kind of aggressive political forgery. Poland, Czechoslovakia and Hungary suffered the further historical trauma of communist dictatorship and Soviet military intervention in the four decades following István Bibó’s publication of The Misery of Small Eastern European States. These countries, Czechoslovakia in the form of post-dissolution Czech Republic and Slovakia, all began the process of healing their historical wounds through integration with western Europe and adoption of liberal democracy following the collapse of communism in 1989. 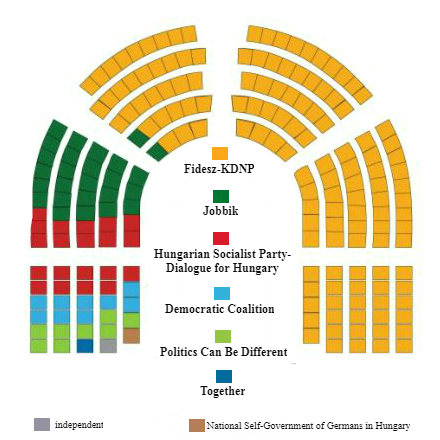 Poland, Czech Republic and Slovakia continue to travel down this uneven road toward political, social and economic integration with western Europe, whereas in Hungary a highly competent political leader—one who conforms perfectly to Bibó’s “phony realist” prototype—has either consciously or instinctively revived Hungarian historical trauma and its attendant political hysteria in order to regain and consolidate his personal power within a hybrid authoritarian-democratic state modeled on Putin’s Russia and Chávez’s Venezuela. Orange Files translated all quotes from The Misery of Small Eastern European States that appear in this post, which was published on April 27, 2014—thus before the government of Poland began to pursue illiberal policies similar to those of the Orbán government. Arriving to Heroes’ Square on a rainy winter night: about 2,000 people, many of the same bad faces (rossz arcok) as at Jobbik demonstrations in the old days, though with the baddest faces now gone; the same old party flags with the double cross emerging from some kind of red-lidded green eyeball, though the neo-Hungarist Árpád-striped flags that used to be so many now nowhere to be seen; national rock thundering from amplifiers on the speaker’s platform, though no longer the bellicose Kárpátia mantras, but something milder, less aggressive, less threatening. Very few cops in sight, though just 50 yards from Fidesz party headquarters, unlike the old days when there were hundreds in full riot gear. But what is really new here is the presence of the liberal opposition: around 100 people affiliated with Momentum, Together (Együtt) and allegedly Politics Can Be Different (LMP) as well, though saw no sign of the latter party. They stand in back, away from the dense crowd gathered around the platform, holding Hungarian and European Union flags as a couple of unknown Jobbik speakers cough and stutter through speeches about the wrongdoings of the State Audit Office (see Legislative Amendments on Outdoor Political Advertising) . I look out at the participants in this demonstration and it makes me think of the joke about the Gypsy, the rabbi and the skinhead who get together in order to save the rule of law. This coalition is surreal. Ágnes Heller, the Marxist prophetess. Árpád Schilling, the apostle of me-too and feminist ideology. 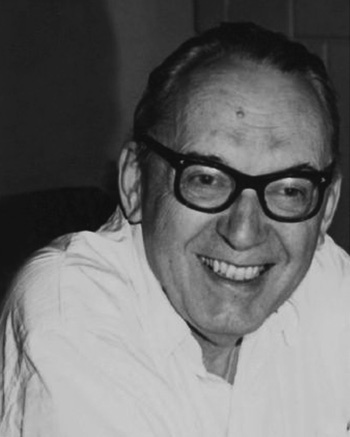 The liberal icon György Konrád. The Ron Werber-led LMP. The Momentum [party] that is campaigning with its Orbán look-alike president. 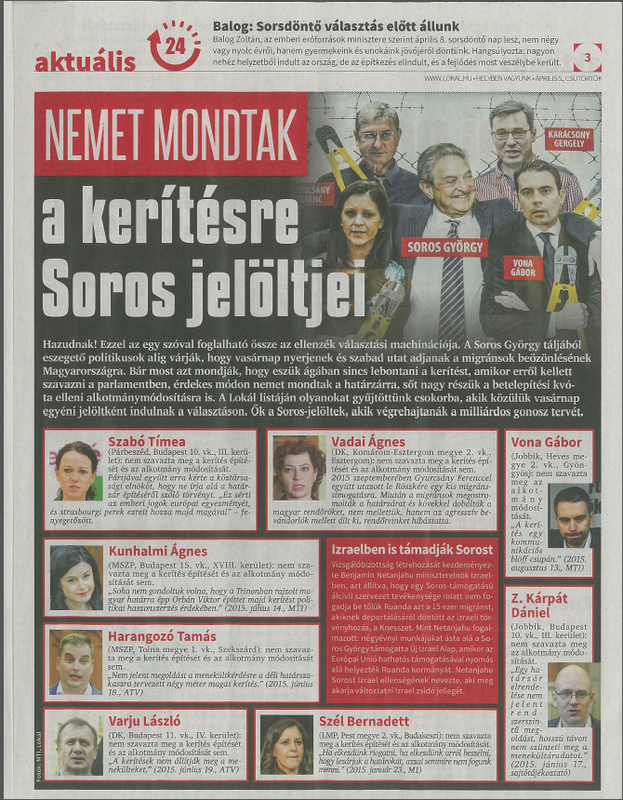 The Outlaw Army [Betyársereg] founder now playing border-castle captain, László Toroczkai, and all the other Jobbik politicians who not long ago were still reviling Jews and Gypsies and rhapsodizing about Putin, though who feeling Orbán’s whip on their backs have learned to like democracy. And, moreover, [Jobbik President] Gábor Vona, who used to serve the causes of racism, militarism and Horthy nostalgia with precisely the same enthusiasm and determination as he now plays the role of the angel of democracy . . . The speech over, the crowd disperses. Walking down Andrássy Avenue next to former LMP leader András Schiffer the dampness on the sidewalks has assumed an icy sheen. A few stray snowflakes fall to the ground. Momentum President András Fekete-Győr (center, green jacket) arrives with party supporters. Momentum President András Fekete-Győr talks to reporter. Together (Együtt) President Péter Juhász talks to reporter. Terry Black (Facebook profile photo). 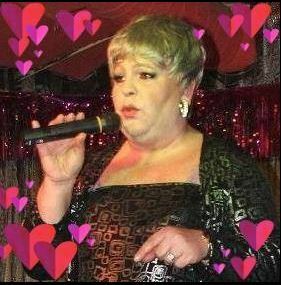 On November 10, 2016, the Andy Vajna-owned, pro-government TV2 television station broadcast a report entitled “Gábor Vona’s Secret Life” [Vona Gábor titkos élete] in which transgender performer and former gay adult-film actor Terry Black (Mihály Rácz) alleged that he had seen the president of the radical-nationalist Jobbik party engaging in homosexual acts at gatherings of Hungarian intellectuals in the early 2000s (source A and B in Hungarian). The pro-government commercial media, including Origo.hu, PestiSrácok.hu, ripost.hu and the Árpád Habony-operated lokál.hu, carried the TV2 report, which was broadcast just two days after Jobbik National Assembly representatives had followed through with their threat not to support the government-sponsored proposed amendment to the Fundamental Law that would have prevented the European Union from resettling Middle Eastern and African refugees in Hungary if government “residency-bonds” were not first eliminated (see Updated: Amendments to the Fundamental Law and The Hungarian Investment Immigration Program).